I spend a lot of time on conference calls, especially now I am lucky enough to work from home. If I’m completely honest, I know how to use my mute button without even looking at the phone. It’s useful for blowing my nose and slurping tea but also for making sure other people can’t hear me typing. Yes, I am prepared to confess this in a public arena. I do other things while on a call. I check incoming mail. I file things. I flick through folders looking for stuff someone has sent me that might be useful for the call if only I’d been organised enough to look it out an hour ago. And I know that isn’t good conference call practice. Being a good conference call attendee means listening to all the debates, chipping in as required, paying attention and being respectful of those speaking. I like to think that I am respectful, in an efficient way. Sometimes conference calls really do contain large chunks of discussion that I only have to listen to at 80% capacity and I still know what’s going on, like recaps on tasks I know all the details of, for example. 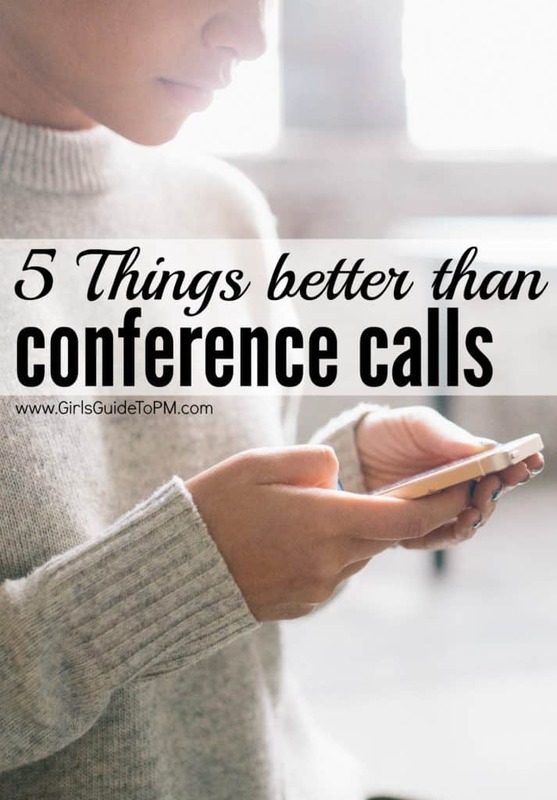 I’ve been looking for alternatives, because while I believe conference calls are here to stay and they certainly are a very useful tool, there have to be other options. Here are 5 options that are better than conference calls, at least some of the time. I am a late comer to instant messaging, but now a convert. It is a helpful way to see if someone is online and therefore able to take a quick question. People in my meetings use it to get a quick response to something if they don’t know the answer. It helps move the discussion on. I can illustrate this with a case study from my book, *. Cornelius Fichtner, PMP, was working on a project to build a new homepage for a business-to-consumer website. The project had a ‘war room’ in Atlanta, Georgia, which was the base for the team. Cornelius’ team was using an instant messaging tool to communicate. “The two developers on my team, myself and the core system development team back in Switzerland were constantly exchanging information about the latest status of our software,” he explains. With most of the team in the same room it would have been equally as easy to speak to each other – but with the client and other vendors in the same room instant messaging provided a private way to communicate. First, I should say that face-to-face meetings aren’t necessarily faster or more efficient than conference calls. If anything, they generally take longer, especially if you include the chit chat as everyone gets a cup of coffee. Face-to-face meetings do have an advantage over conference calling: you can see the individuals. I know you can do video calls, but standing next to someone lets you really see how they feel without the filter of a webcam. You can make them less painful by learning great strategies to chair a meeting and by streamlining the process with templates — all of which is available in my Meetings Template Kit. Meetings are time-wasters. Meetings cost money. Wouldn’t life be easier if you didn’t need to attend meetings at all? What’s the difference between a workshop and an ‘ordinary’ meeting? For me, a workshop is structured for interaction. There are exercises, flip charts, brainstorming. You might use an external facilitator. Someone will be appointed as the official note taker. There is small group work and reporting back to the main session. You can combine some workshop-y elements into your normal team meetings – you don’t need to hold a separate session if all you want to do is, say, identify dependencies and constraints on your project. However, you might want to write up your notes separately from the main team meeting minutes. If you can’t work out how to make a meeting relevant to everyone attending, then maybe a better solution would be to have individual catch ups. Talk to your project sponsor separately from the dev team. Call the testers and chat to them without the Finance rep listening in. It’s not because you want to shut them out from general project news, but you want to save them time and get through your updates more quickly. This approach is really helpful if you are preparing project reports and want quick progress updates. You will have to reassure your team that you aren’t hiding information or stopping the flow of data. This works best with teams that already have a trusting relationship. If the trust isn’t there, individuals may feel as you are keeping important information from them. Meetings are time-wasters. Meetings cost money. Wouldn’t life be easier if you didn’t need to attend meetings at all? If a meeting is in your diary and you don’t need it, cancel it. Don’t put people through the boredom. I know I’ll never be rid of conference calls and I don’t want to be. They are hugely effective used with the right people and in the right circumstances. What I want to avoid is the ‘downtime’ on the phone. There are other ways of engaging with project stakeholders and I think we should use them where it’s appropriate. *The second edition of this book is called Collaboration Tools for Project Managers. I agree that sometimes people can just convene meetings unnecessarily. I think it’s also useful to look at other ways of collaborating and exchanging ideas. For example Slack and Microsoft Teams. I am currently trying to encourage my team to collaborate more on platforms like Teams eg if we need to work on a document or agenda together. It can help save a lot of time! The above are also required but if you are of opinion that conference calling is not required, it is not correct as all of the above mentioned techniques are not feasible everytime. Hence, businesses globally are using online conferencing tools like webex, R-HUB web video conferencing servers etc. for conducting online meetings, sales demos etc. Thanks, Tony. It’s not possible to get rid of all meetings, but I think it’s worth bearing in mind that you *can* cancel routine meetings if you don’t have anything to discuss that week, or you’ve all met recently anyway and meeting wouldn’t add anything. I certainly agree that sometimes meetings are the only way to move things forward on projects. I tend to agree with the last statement about doing away with meetings in general, but when you have a need to get everyone on the same page it is a must. Add to that your customers, some of your team and others are not located in the same facility but the conversation must go on. That’s where teleconference come into play but ensuring everyone understood what was discuss is paramount; follow-through with notes or minutes or whatever sent to all participants and ask for feedback.